Here, I would like to express my admiration for the work that you all have been doing to society and I consider myself very lucky to be associated with you. Although we could not meet you and Smt. Hema, we could easily feel your love and affection through your close associate Sri Poovarajan - whom I am so impressed with. Sri Poovarajan has such a strong character and he is doing his work with so much dedication and love and humility - I personally am so proud to be his friend and I feel that with such people as my countrymen, working in such remote areas, the day is not far when Mahatma Gandhi will be smiling from heaven saying that his dream of a great nation is getting built. During our short stay of one day, we were able to go across the mountains and jungles and see the wonderful work that Ekal has been doing in remote areas. Particularly, when we met the little children and felt their love, it was like being in heaven and surrounded with little angels. Due to shortage of time and considering the need to leave before dark, we were not able to visit 'Bangla Paddi'. But this was compensated by showing us the schools at 'Kandi Petti' - the contact village as well as 'Pudu Colony'. At Kandi Petty, Smt. Ponnamma has been teaching the children quite a few new things. However since this school is new, we understand that she requires a bit more training and she will do very well. But her love for the children and her own enthusiasm was easily portrayed. We really liked her dedication and sincerity towards her job. Ms Lalitha (Pudu Colony) was excellent. She had complete mastery and we were really impressed by the way she has trained the children. When Shiva was answering all the general knowledge questions we asked him, we were so happy. I have also suggested a few things which you could consider implementing depending on the convenience and feasibility. Special sessions could be held where all children are asked to watch educational TV programs (maybe once a week) together and after the program, the teacher will ask questions and correct answers will be rewarded. Perhaps you could assess such children by giving points and send me names of the winners for the month, and I can arrange to send them special gifts. Every time someone visits these schools, enthusiastic children could be given latest newspapers, magazines etc, which could help them enhance their knowledge of the outside world. Children must be encouraged to watch more of 'News' programs rather than 'movies' on TV. At least some emphasis to be given to teach some basic English so that they can use this to absorb more information from Television. I know that it is not possible to visit these remote schools often. Therefore, such ideas could possibly be explained to the teachers during their training sessions. These are only my humble suggestions which you may like to implement as and when it is possible. Once again I would like to express my deep sense of satisfaction and joy this short visit has given me. 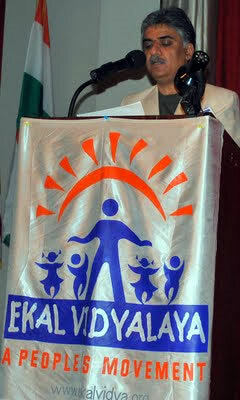 After seeing these children, I now feel totally involved and even more committed to the EKAL cause. Ekal USA Annual National Meet announced EVF USA organizing its Annual National Meeting in WASHINGTON DC from 18th Sept. to 20th Sept. 2009. This is the time when Ekal USA group goes through past year events and plan for the next year and get lot of inspiration from the gathering for the cause of Ekal. India Today, in its English edition of 27th July and in Hindi edition of 29th July, has published the activities of Friends of Tribals Society and about the 28000 Ekal Vidyalayas across the country. Friends of Tribals Society has taken up the most challenging task of reaching out to the most deprived people living in the remotest regions – tribal community by providing functional education through One Teacher Schools. We are most grateful to BPCL- Kochi Refineries for giving us spontaneous support, after visiting our schools in Wayanad hilly regions. Impressed with the dedicated work of our field workers and realizing the dire need for education of the children in the absence of any schools in the vicinity, BPCL officials were overwhelmed and applauded the unique efforts of our Society. Seeing the inadequacy of the thatched shed of the school, they came forward to provide construction of concrete sheds with asbestos roofs for 5 schools at the cost of Rs 60000 each in Wayanad Anchal. This has not only facilitated effective functioning of schools but also given a fillip to the local community, as they could conduct Satsang and cultural programmes in the buildings. Thanks to the local residents who came forward to provide their land for construction of these schools. But for these schools, all these children would have remained illiterate like most of their parents. It is gratifying to report that with the imparting of value education to the children, there has been a total transformation of the village. To support our programme of health education in these villages, where there is no hospital in the vicinity of 10 km, BPCL came forward to provide an ambulance, in Nilambur, badly needed in this region. This has come as a boon to save the lives of the tribals in these remote places. Nilambur Samity is running the ambulance effectively on self-sustaining basis by providing free service to the poor and subsidizing the cost with payment service to the general public in the region. It is a matter of pride that BPCL has come forward with sponsorship of 15 schools this year. More than anything else, the villagers in these tribal areas, were overwhelmed and felt that there is someone to care for them, as this is the first time that corporate officials landed in this place. If one could vouchsafe for ‘INCLUSIVE GROWTH”, it is the corporate initiative of BPCL Kochi Refineries to reach out to help the tribals in Wayanad who remain vulnerable to exploitation by the anti-social elements due to illiteracy. 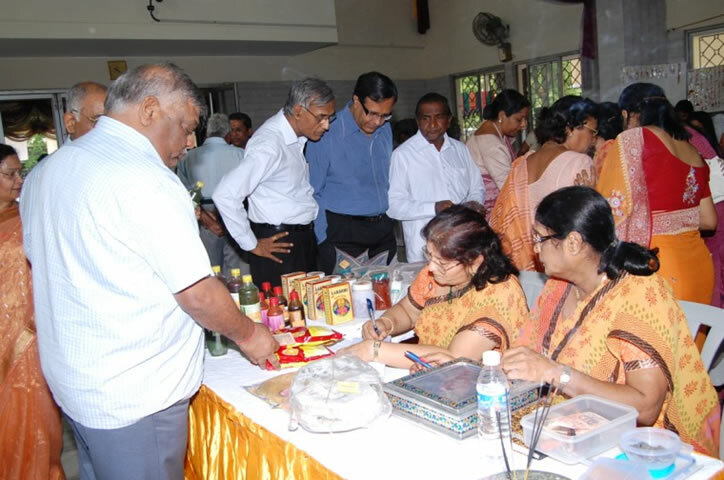 The FTS Chennai Mahila Samiti had organized a grand BAZAAR “FTS extravaganza” on the 15th and 16th of July, 2009 at Geeta Bhavan. 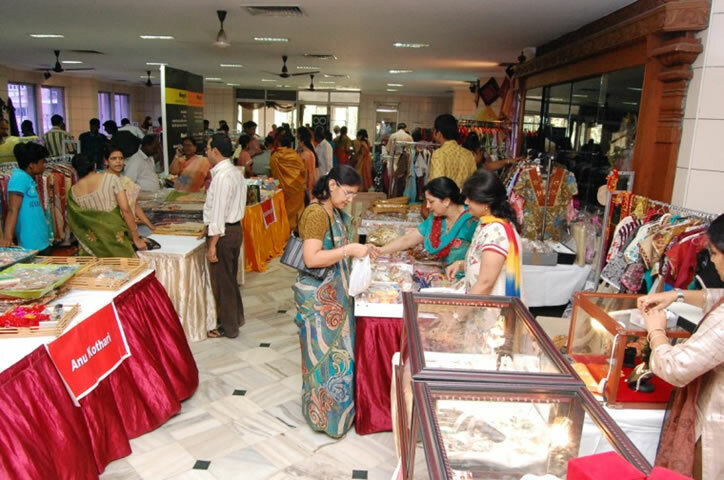 The bazaar had participants not only from Chennai, but also from Madurai, Trichi, Calcutta and Delhi. The bazaar gathered 76 stalls which included the home-stalls where products from the tribes like honey, vermin decompost etc were on sale. 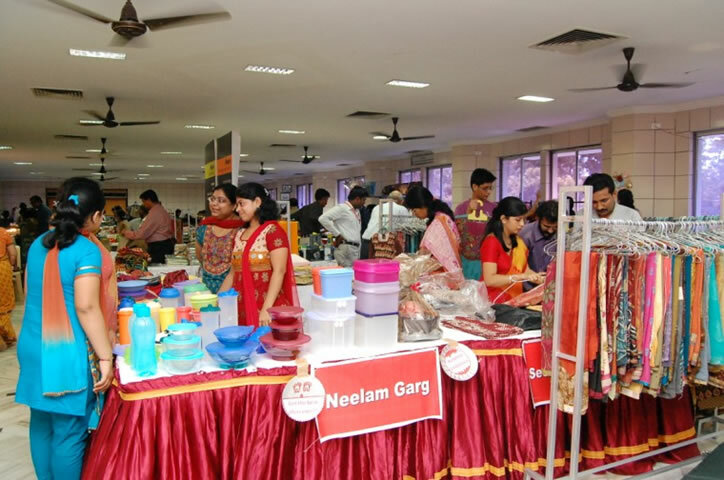 To encourage women entrepreneurs, home made products like papad, pickles, cane baskets etc were also exhibited and sold. The Bazaar became a huge success not only in terms of the collection made (Rs. 4 lakh) but also in terms of the crowd it attracted over the two days. There was great response from the participants also. We hope to have such events in the future too. “Wake-up Mother Wake-up” was the resounding theme of All India Mahila Nagar Sangathan Varg held in Nasik on 4th to 5th July, 2009. 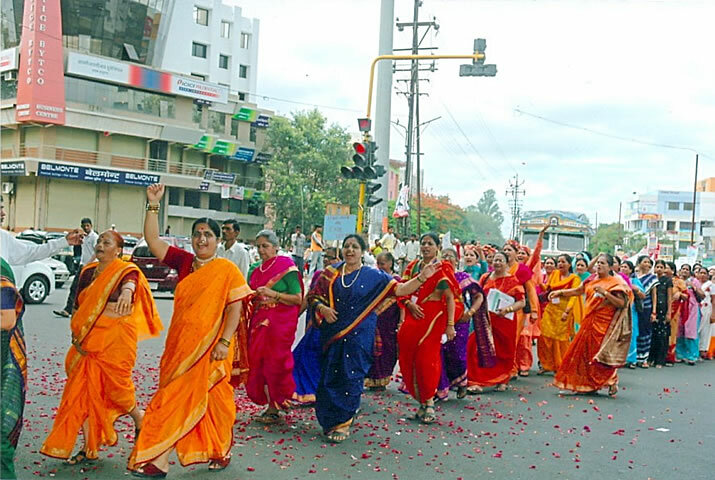 The yearly congregation of Ekal’s lady volunteers from different Chapters, SVOs and Anchals of the country took place in Maheshwary Bhawan on Nasik Road. 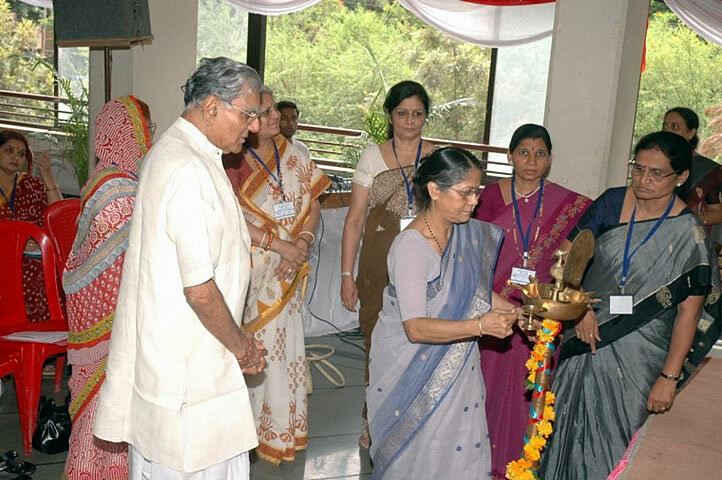 From Himachal to Karnataka, around 170 women volunteers came to participate in this Varg. In two days, 10 sessions were organized in which nearly 60 representatives expressed their views on achievements, organizational work and future targets. The first Introductory Session, taken by Smt. Manjushree, All India Prabhari of the women organization of Ekal Movement on 4th July, set the tune of the ‘Varg’ and she categoritically explained the purpose & motto of the Varg. “We are here to learn and share our experiences and we will go with well defined goals to achieve within a year”, she said. The formal inauguration of the Varg was done by Sri R.L. Kabra (Bapuji) and his wife Maa Ratni Devi Kabra. Sri Bapuji in his speech emphasized and glorified the significant role of ladies in Ekal Abhiyan. Sri Nemichand Poddar, President, FTS Nasik welcomed all the guests including distinguished members from Nasik. 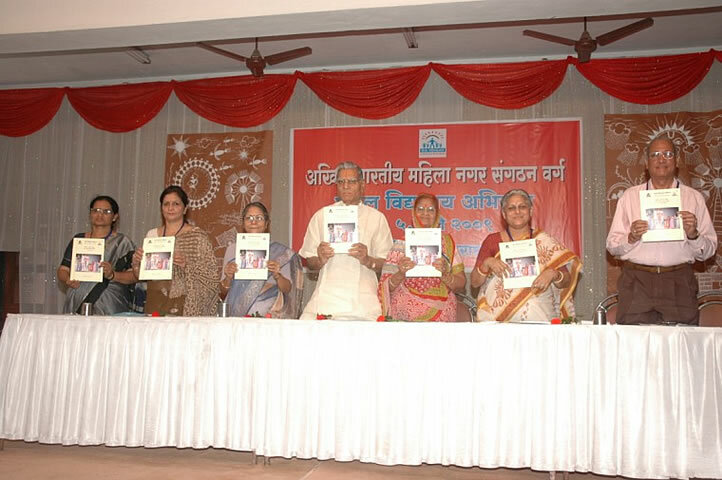 The book on Nagar Sangathan Method written by Manjushree was launched by Smt. Kabra. The famous dance drama “Belle” known as “Krishnayan” kept the audience spell bound on the night of 4th July. It was highly appreciated by one and all. 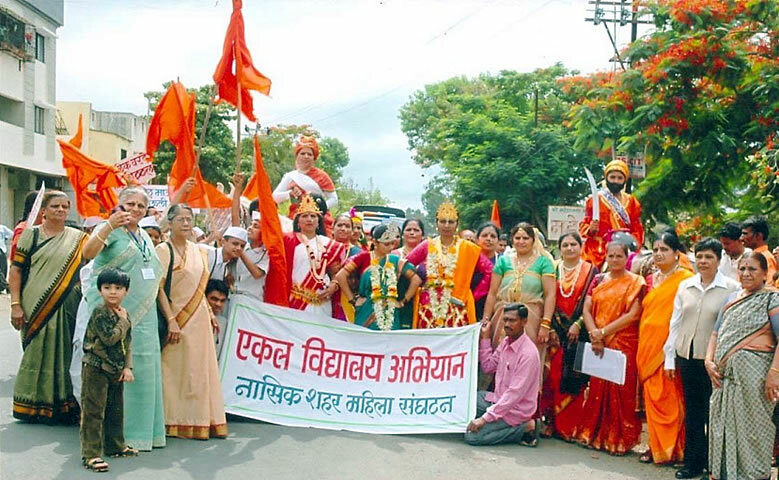 On the morning of 5th July, people of Nasik woke-up to witness a well organized “Prerna Yatra” of 250 ladies and children of “Dindi” marching through the main market of Nasik. In front of the procession were two ladies adorned as “Jhansi Ki Rani” and “Veer Shivaji” on horse back. The “Jhanki” of brave Mothers of Maharashtra was also displayed on an open vehicle. Members of the chapter with Sri Nemichand ji and Bapuji also walked all along the procession for one and half hours. The procession was welcomed on its way with rose petals thrown from above. All the participants found the Varg very inspiring, enriching and encouraging to proceed further with definite goals and to accelerate the Ekal Abhiyan. The target is clear: 10 lakh Ekal children’s education will be ensured! Sisters took vow that they will achieve this target through several means like Seva Patra Scheme, Vavasi Shiksha Parivar Scheme (Rs. 1,000 two children per annum), small collection through different methods. 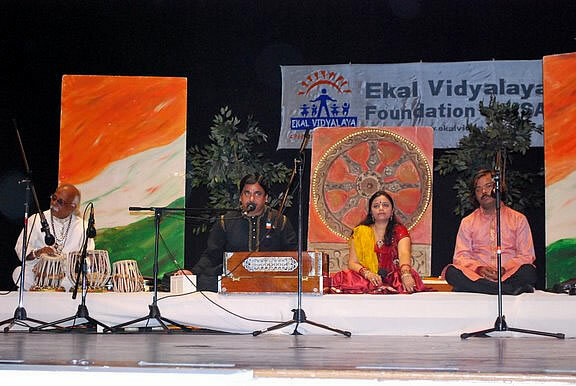 They decided to take massive movement to contact people and spread the message of Ekal throughout. Two Power Point Presentations, on “Seva Patra Scheme” and the “Raffle Sheet Scheme” in urban schools were presented by Ms. Pooja Choudhary of Nagpur and Ms. Vimla Damani of Chennai, respectively. Both the presentations were highly appreciated. “The Raffle Sheet Working in Schools” opened a new avenue for small collections as well as an effective way of reaching people enmass. The Varg was wonderfully organized by a strong team of 40 ladies of Nasik Mahila Samiti. They were given whole hearted support by the leadership of the FTS Nasik. The Mahila Samiti took out a souvenir and managed to generate funds through advertisement. All the arrangements were A-class. Credit goes to the team spirit of Nasik Chapter and SVO members and, of course, to the ladies under leadership of Smt. 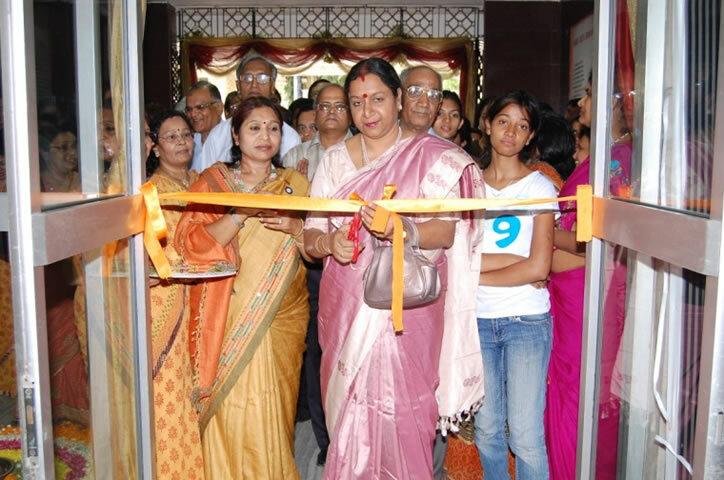 Asha Kulkarni, President, Mahila Samiti, Nasik. The Varg will be remembered for a long time till it is surpassed by next year’s event supposed to be held in Nagpur. We had planned a trip to Agra from Delhi and were to return to Delhi via Alwar, a town in Rajasthan. It was the month of June and we started our day at 7:30 going to the 7th man-made wonder of the world – “the Taj Mahal.” When the Taj was built, nearly four centuries ago, there must have been water in Jamuna River and lush than it is now so the grandeur of the monument must have been phenomenal. Beauty and workmanship of the Taj is still mesmerizing. There is a guest house on one side and a mosque on the other. With the June heat beating on us we decided to skip the two other buildings. When we finally reached the village and parked, a big group of women approached us. I was clueless as to what was going on. My sister-in-law and I found ourselves standing in front of them and they did a “tika” on our forehead and put an “odhani” on our heads as they sang a Rajasthani welcome song. I stood there in awe with the warmth and love that they showered upon us and we all followed them. Right across there was this verandah type place open on two sides where about 40 children from ages 5 to 13 were seated in 3 neat rows. The teacher stood there in the front with a 2 ft X3 ft black board behind him, a Hindi alphabet chart on the wall and a small statue of Lord Rama in the corner. This was the school that we came to see. My children aged 16 and 10 and my brother’s children 12 and 6 were with us. We sat there in front of the class on the side as the children started off with a Saraswati prayer. 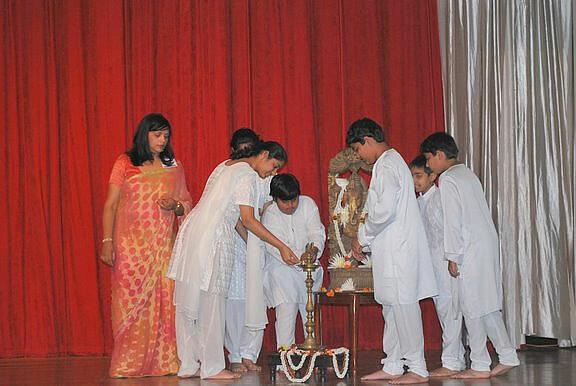 All the children participated in the singing and knew these prayers well. 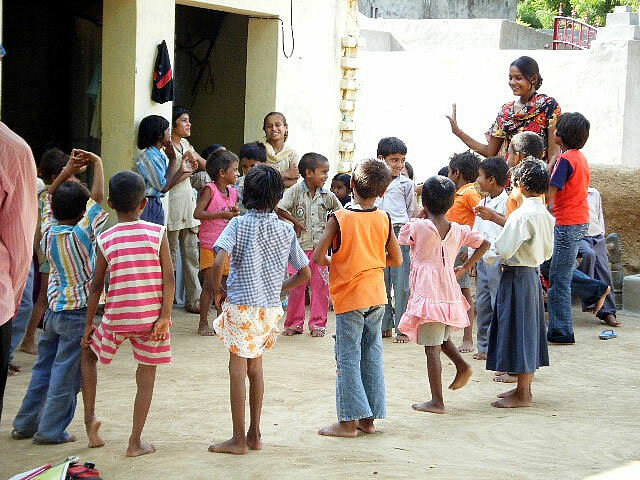 Teacher asked some of the smaller children to recite the Hindi alphabet and share with us the days of the week and months in the Indian Calendar. After language skills, he asked them about numbers, including identifying, adding, subtracting, multiplying and dividing. Even though they called out the numbers and maths terms in Hindi, they wrote the numbers in English. They did some complex maths problems of their age. One child also recited multiplication table of 17. They sang prayers and several folk/Rajasthani songs. Avadh ji asked for children to come up and dance but the teacher said he would know who to call for, not all kids would dance. And yes the teacher was right, when he called upon some kids, they did not hesitate and stood up in front of the class. Villagers and guests were watching them as they performed the dances. They danced on folk and other known movie songs. As they sang, my nephew looked like he wanted to join them in dancing, too. The girls did an outstanding job. There were 2 children in this group who were “Anivarya bachhe,” meaning this is the only school they attend. Since this village was close to other bigger villages, there were public schools that most other children were able to take advantage of. Then the teacher invited us to his home for tea and biscuits. He wanted to make sure we didn’t leave without coming over to his place. The whole village must have gathered around to meet the visitors. Some of the children had walked over 1/2 km to be there. Kids were really excited, very well behaved and did an excellent showcase of what they learn at Ekal Vidyalaya. 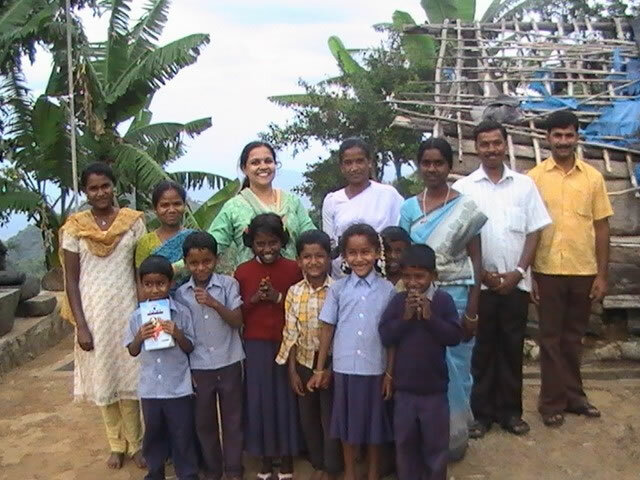 It was very obvious that the villagers were very happy to have the school in their village. Avadh ji, who over sees all the Vidyalayas in Rajasthan, told us there are other schools in Rajasthan where population is not so dense. In the mountains, one family lives on a hill and another lives on a different hill some distance away. For one such school in Abu area, he said the teacher would go to each home and literally hand hold the children and bring them back to school at the beginning of the school day and take them back home when they are done. This was how the teacher got the family and children interested in coming to the school. After the initial hard work, the students now walk to the school by themselves. One dedicated teacher and the unwavering drive by Avadh ji’s team that stood behind this teacher made this school a success. Dedication, determination and sacrifice of the field volunteers are truly inspirational and heart moving. Our experience in this little village of Alwar, Rajasthan has touched each one of us. How little you need in life and how much you can do with very little resources. I fall short of words to describe the affection and admiration showered upon us by these villagers. Our taxi driver, who was getting a little aggravated with us for bringing him on this excursion, was touched by this experience as well. He was glad we made this detour after all. Even though we visited the Taj that morning, it was this experience in Alwar that really stood out for me. An experience that is priceless to be treasured and shared for many years to come. Many thanks to Avadh ji Sharma in Rajasthan and Sangita Gupta in Delhi Ekal team for making this possible for me and my family. On 16.07.09 a Vanyatra to village Naya Gaon in Ballabhgarh Sanch of Faridabad Anchal was successfully done by 3 donors from US - Smt. Archna, Ms. Simmi and Sri Sunny. They were overwhelmed by the performance of children in the school and appreciated the strenuous work Ekal is doing in remote villages.